U.F.O -abbreviation for Un-Finished Object. [noun] A sewing term. If you sew you have ’em. They lurk in closets or huddle in bags. If left long enough they transform from UFO into a WTF was I thinking? or an OMG I remember this! and get cut into quilt pieces if they are lucky or simply binned if not. This past Friday I had a pre-summer closet shuffle, a.k.a. What-Fits-This-Year and I found two UFOs from last summer. I have a bias towards slips. I am a slip convert, a slip missionary even. Do you know that these days many women don’t own even a single slip ?! I have an unused reproduction pattern for a 36 inch bust, 40 inch hips (produced by The Vintage Pattern Shop) of this 1940s bra, slip and knickers to give away. The draw is open from now, Thursday evening, until midnight Feb. 14th UK time. If you are interested just leave one comment below and on Saturday afternoon (UK time) I’ll do a random draw and announce the winner and pop it in the post next week. Where did that summer go? Cold, wet and nasty here in the UK now… where I am at any rate. But tomorrow morning at some hideously early hour I start the 18 hour long trip that lands me in still warm and sunny southern New Mexico to visit my mum for two weeks. A very welcome break from work and crummy weather 🙂 So this post is a quicky Hi y’all with a free 50’s style dress pattern AND a cute bag to make. I did these two projects for the Christmas issue of Making Magazine that hit the newsstands yesterday. The patterns can be downloaded from my free stuff page. The dress pdf is 33 pages! I’ve put the full size A0 & A1 pattern pdfs up too for those of you with access to large format printers. I expect to be making quite a number of the bags myself soon in tweed, fake leopard fur, sequin- fab to give as Christmas presents I thought. I resisted the impulse to edit my pics to make my waist look as small as the illustration… or to make the illustration look as realistic as me. Nicole Needles made a LBD! I’m so thrilled to see that someone has used my free Little Bias Dress pattern with such great success 🙂 Click on the photo to get to Nicole’s blog for more photos of her fab results plus an interesting mini history lesson on the Great Depression and her thoughts behind making a cotton version. Oranges & Lemons, Almost A Miss and Summer Fabrics Waiting. and round and round and round in my head went that song the entire time I sewed this dress. GaaaH!!! I’m about as far from being a London cockney as a transplanted-to-Brighton ex-New Yorker could possibly be. My children learned the lyrics in school and I learned from them as we marched around the South Downs singing this at the top of our lungs. Gave the livestock quite a fright. 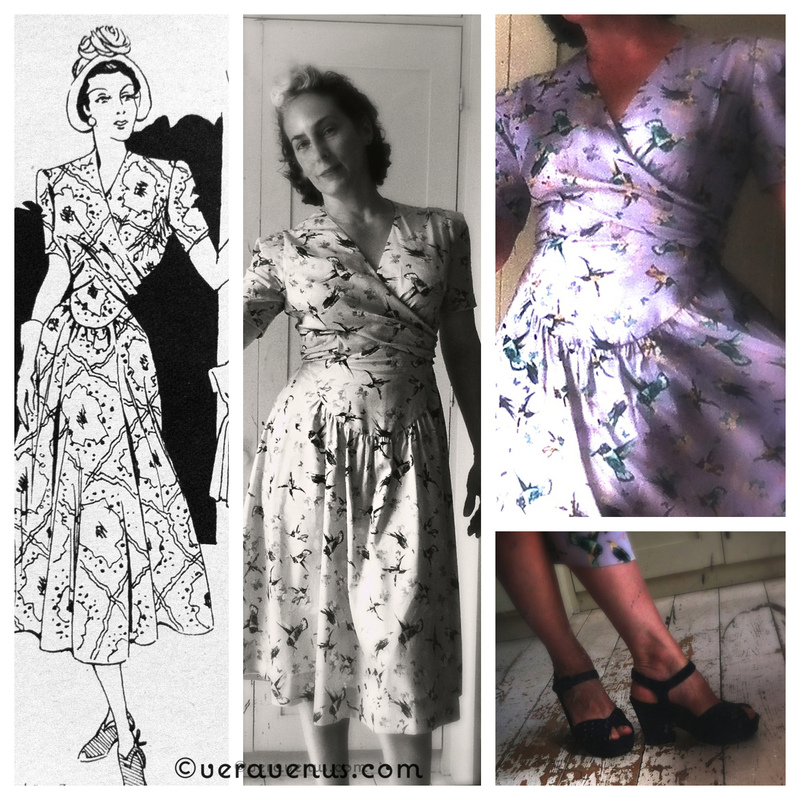 Capital ‘V’ Vintage, A Bias LBD & A 2yr Blogoversary! This past wet and cold Sunday morning seemed a good day for mooching around antique markets so the Mister and I headed to Lewes, East Sussex. Brighton has some good ones too but the grass is always greener in Lewes. I got to choose where to start and it was straight to my fave, May’s Antiques, where a small but great selection of mostly pre 50’s clothes, is always to be found. I do buy and wear some 60s/70s clothes but sometimes I just want something older than I am- and that’s what I call Capital ‘V’ Vintage. Within minutes I saw this wonderful 1930’s chestnut brown bias cut full length gown and just knew we were made for each other. The main fabric is slinky rayon satin and the upper bodice is a dense cotton velvet. The winged sleeves have something stiff and slightly crunchy in them to make them stand up… I’m thinking probably a wide horsehair braid. The panels are pieced in lovely curved lines but it was the back detail that was the deal maker. It’s in pretty good shape, only a couple of small mends and a dry-clean needed. I really rarely make such a flash decision- and do sometimes regret it when I do but not this time. I consider the dress a ‘study piece’ however it does fit me well and could certainly be worn if the right occasion arises. ‘Dinner at Eight’ anyone? Just as I was leaving I spotted these four French magazines. I almost didn’t look at them because I thought they were the same vintage Marie Claire magazines that I’d already bought a few of a while back and boy oh boy I’m so glad I took a second look! The earliest is from 1939 and the latest 1951. The cover illustrations are so gorgeous that I would have bought just those if that’s all there was to them but the insides are just packed with page after page of fabulous dress illustrations and a few more colour plates too. I’ll post a few scans from them at a later date, they are very inspirational if you are interested in details from this period. Moving along to The Lewes Flea Market we admired a small 1834 painting of a Brighton Shrimp boy, pondered over pretty china, discussed the clock yet again, patted some sad taxidermy and finally arrived in front of this lovely art-deco convertible brooch. A while ago I read a great post on Oh For The Love Of Vintage all about dress clips and then realised a little clip I already had was actually half of a convertible brooch. Then I received a complete convertible brooch this Christmas and as of Sunday I have three ( two and a half really) convertible brooches. And that’s how a collection begins! If you saw my Birdy Beret pattern review post last week I mentioned I was going to a White Mink “speakeasy” night and aimed to make a new dress in a day. This LBD (Little Black Dress or Little Bias Dress, take your pick) was the result, made in record time! 12-5 sew as fast as possible. 5-6 take a break & say hi to family. 6-7 try on and decide a black organza flower brooch decoration is desperately needed and make one. 7-8:30 bath, hair, make-up and wolf some dinner down. Saturday – lie on a sofa and don’t move much. Now, I know for a fact a lot of other sewers get that awful compulsion to make something new at the last minute rather than wear something already in the closet. 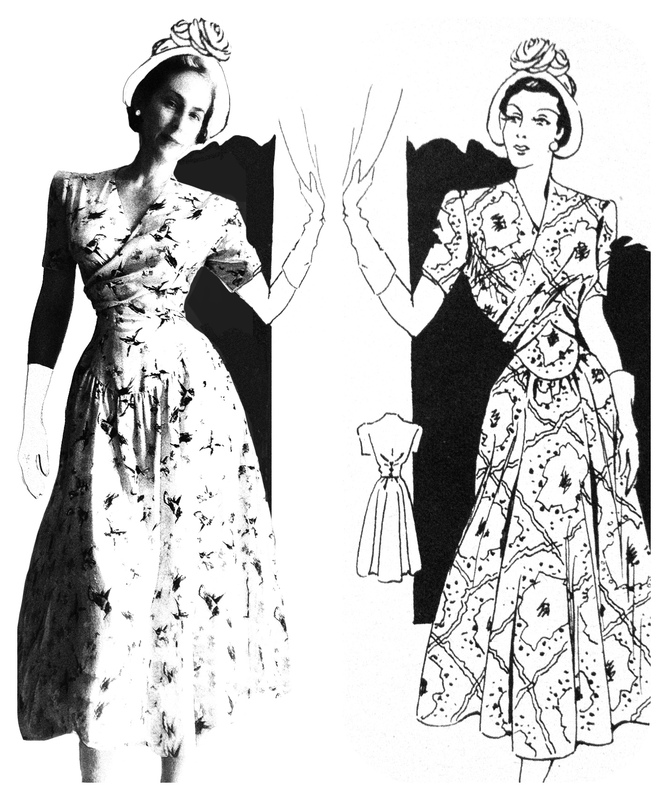 Confess that you’ve gone out with a raw edge hem or a waist pinned together – or what is the most unfinished state you’ve ever worn a dress in?? Tell me, I won’t tell, I promise! And shame on me as I forgot VeraVenus’s blogoversary on January 11th….will she ever forgive me ?! To belatedly celebrate and show my heart-felt thanks to all you SewVeraVenus readers and followers for your ongoing interest and encouragement I’ll be posting a new free downloadable pattern quite soon: I thought I’d do that new LBD pattern in two sizes and also a give-away draw for one printed and mailed to anywhere copy of this dress pattern. Stay tuned for the announcement. I hesitate to say how ‘soon’ is quite soon… as I need to digitize and redraw it, but I’ll try for not too long a ‘soon’. Meanwhile I leave you with this swinging clip from White Mink.